It is really starting to feel like the holidays here in downtown Boulder. After a great kick off to the holiday season with Switch on the Holidays, the grand illumination of the Pearl Street Mall, it's beginning to feel like the most wonderful time of the year! Along with festive lights and the holidays fast approaching comes show stopping window displays! I love strolling downtown this time of year for the sole reason of looking at the beautiful holiday displays the stores downtown have created. I wanted to showcase the best of the best of the best this year so all of you can see for yourselves the craftsmanship that goes into curating these festive displays. Up first on my list of must see holiday window displays downtown is Two Sole Sisters. 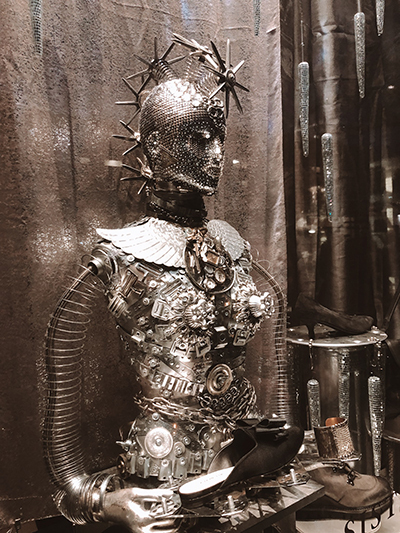 Their window is stunning and fierce featuring silver sculptured industrial mannequins in front of a metallic backdrop (pictured above). They also added bedazzled silver icicles to match as well as glittering silver holiday ornaments. This avant-garde window pairs perfectly with the luxurious leather boots and sneakers at Two Sole Sisters, this is a holiday window that you don’t want to miss out on! Another must see holiday window on the East End is Bliss! This adorable store is filled to the brim with cute trinkets, home decor, and beautiful greeting cards and stationary. Bliss’ gorgeous holiday display features garlands of pine, mistletoe, rustic Christmas bells, wreaths, a jolly looking Santa Claus and elves. Bliss’ holiday decor looks like the perfect winter wonderland brought to life! ‘Tis the season for sleek winter styles displayed in the Weekends window facing Broadway, along with luxurious winter trends, cozy knits, and boots are also featured. Weekends adorned colorful and festive calligraphy in red and white, along with white snowflakes to complete this stylish and subtle window display that is timeless with a modern twist! If you are just as Free People obsessed as me then you’ll love their fun and free spirited holiday display featuring lavish knit sweaters, gorgeous holiday garments and statement accessories that will make any outfit this holiday season pop, their window decorations include feathery white garlands along with red pops of color. Our office is right next to Free People and every time I walk by something new always seems to catch my eye! Earthbound, Art Mart, Peppercorn and Chelsea all receive honorable mentions for stellar holiday windows as well! So, what are you waiting for? Come get into the holiday spirit and check out these stunning window displays for yourself!